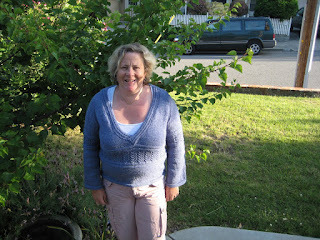 I have finished my Simple Knitted Bodice and managed to eke one wearing before it got too hot. 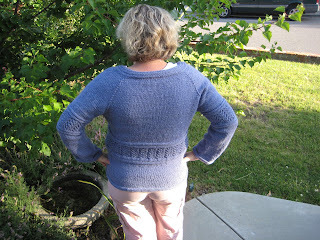 I'm really pleased with the sweater, easy to knit, easy to fit. I would totally recommend it for a first sweater. 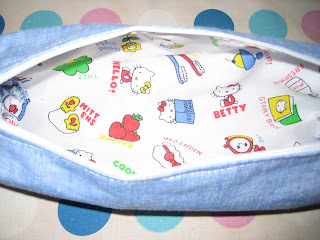 The pattern is by Stefanie Japel, issued by Stitch Diva. The yarn is Sirdar Balmoral which I received for my birthday from Eileen. I did modify the pattern by eliminating the waist shaping, to match my own lack of waist shaping. I also knitted the lace waistband a little lower than the pattern. The great thing about this pattern is that is is knitted in one piece from the top down, so its easy to keep trying it on to ensure you get the fit you require. 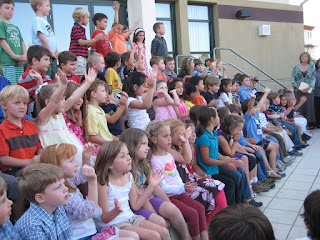 Finlay's class were part of the Kindergarten Chorus - 80 kindergartners singing about growing, saving the earth, and saving water...they were actually very cute. Finlay is in the middle of the front row. 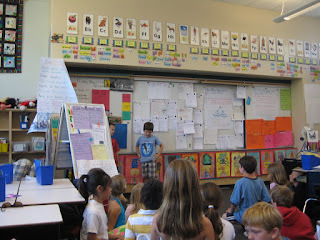 Adam's class gave a poetry recital together, then parents were invited into school on Friday morning to hear each child recite a memorized poem. Adam chose 'I have a dozen dragons' which was a 4 verse rhyming poem. He did an excellent job on it and received top grades for memory, interpretation, clarity, and enthusiasm! 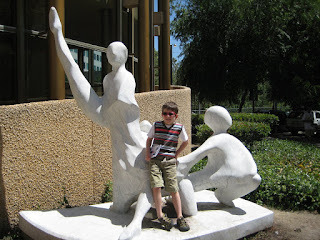 Signing him up for drama club during summer school is beginning to seem like a good idea. 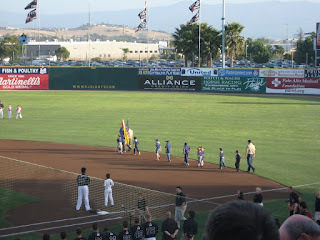 Last Friday the scouts had the honour of performing the flag ceremony at the SJ Giants game. In front of a sell-out crowd the scouts walked onto the field with their flags, and saluted while the San Jose Water singers did a very creditable rendition of the National Anthem. Adam admitted to being very nervous - but I think I would have been too in front of over 5000 fans. He is the third in the line above, wearing shorts. As the cubs walked onto the field there was an audible "aahh" from the crowd. 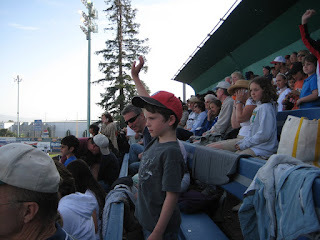 We all enjoyd the game - even though the Modesto Nuts won! ...my new toy! 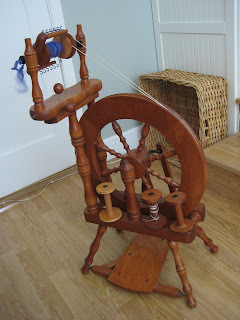 This is an Ashford Traveller spinning wheel that I bought from Craigslist on Friday. I think it was produced between 1980 and 1991. Don't know what wood, but it's a nice solid wood with a lovely patina. It's a double drive wheel, although you can rig it as a scotch tension wheel, which I think I will do as it's supposedly easier for beginners. 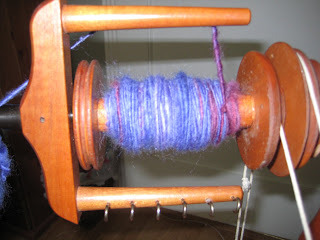 This was some Blue Faced Leicester roving that I bought from Blue Moon Spinnery at Stiches a couple of years ago to use with my drop spindle. As you might expect, I have a lot of it left. The spinning is rather uneven, as I'm really still getting used to the pat head/rub tummy aspect of treadling the wheel while drafting the fibre. I've ordered a maintenance kit from Yarndogs, and will sign up for a spinning lesson as soon as possible. Really I need to learn how to adjust the wheel for starters, but I could certainly use some technique on my drafting too. Spinning is supposed to be relaxing but at the moment I realise that I am holding my breath while I'm spinning, which is making it less relaxing than it might be! * Julie is named after a friend, also a Kiwi. Having seen some lovely box bags for sale on Etsy.com, I decided it would be a fun project to try. 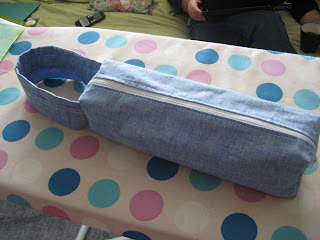 Last week when I got the sewing machine out last week to patch 4 pairs of jeans, was as good a time as any. I thought this would be a quick hour or so, but actually making 2 bags took me several hours! I used this tutorial and materials I had on hand. 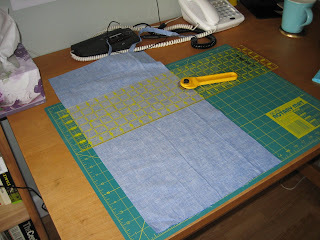 I got out my old cutting mat and rotary cutter as accurate cutting is essential to the success of this pattern. The denim is left over from shortening Adam's bedroom curtains. 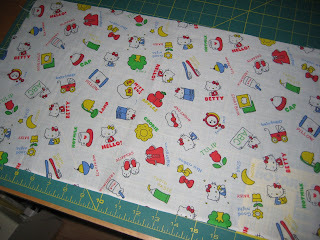 This Hello Kitty fabric is practically an heirloom: I bought it in France when I was a student (so we are talking more than 25 years ago now), long before HK stuff was widespread, and it was so expensive I only bought 0.5 of a Meter. I'm using these little bags (because I also made a green one - not shown) for my collection of double-point-needles and knitting notions. Another pair of Monkey Socks. This version is knitted without any of the purl stitches. 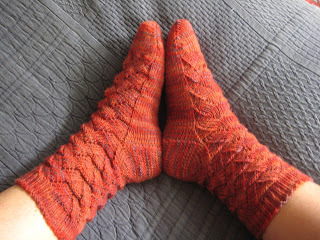 The no-purl pattern made these socks quicker to knit, but still kept a nice simple lace pattern. The pattern is really hidden by the stripes in this yarn, which is Hazel Knits sock yarn in the Bobbin's Nest colour which was created especially for Bobbin's Nest Studio in Santa Clara. The boys have really admired the socks - and I'm very pleased with them. 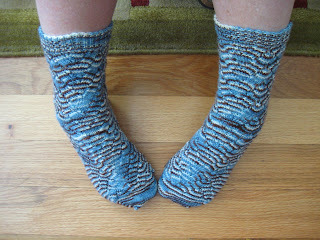 I think the pattern creates an almost deco effect with the blue and brown waves and the yarn is lovely. Mother's day in the US was celebrated on Sunday. As the boys get older they are more involved in planning and executing my 'treats'. 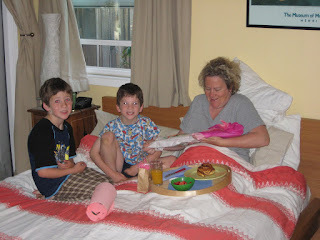 In the picture I am unwrapping the gifts that they had made at school (ceramic mobile, and plaque) with my special breakfast on the tray. They had prepared the breakfast themselves (fresh-squeezed orange juice, strawberries, and a cinnamon roll) while Nigel made the tea. They had also arranged a vase of flowers for me. It's so nice to see them growing into thoughtful little lads! 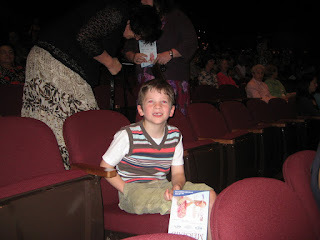 In the afternoon I had a ticket for the ballet, and Finlay asked if he could come with me so we both went to see the Ballet San Jose performance of Song and Dance. Skipping out on the second part of the program gave me an afternoon to lounge about the pool reading, while Nigel throw some steak on the barbie, and the boys played nicely. Apparently my request for the gift of "no fighting" was taken seriously. I have a couple of projects on the needles at the moment (as well as the inevitable socks). For my birthday my mother-in-law Eileen sent me some wool: Patons Balmoral (a silk and wool mix double knit) in this nice lavender shade. 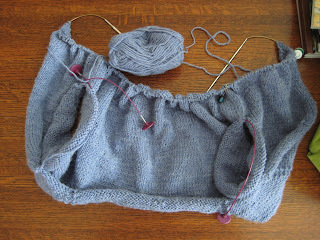 I decided to knit a pattern I have had in my queue for a while: Stefanie Japel's Simple Knitted Bodice. It's a top-down raglan with a lace accent. I'm knitting the whole jumper in the same yarn rather than using a contrast. So far the yarn is knitting up really nicely, it's soft but with good stitch definition. Would have been a good choice for cables really - but it's also a good match for this pattern. I also have a lace pattern on the needles. This is Ishbel from Ysolda Teague. 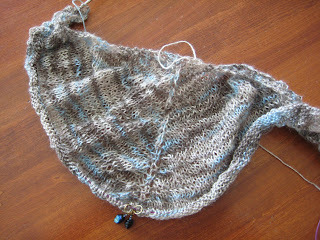 I'm knitting it in Geisha yarn from Blue Moon Fiber in the Lucy Colourway. I'm up to the lace border of the shawl and somewhat stalled when I could not match the lace pattern stitch count with the written instructions. I read on Ravelry that I should ignore the written instructions and just work from the chart - but then I got sidetracked into the sweater. 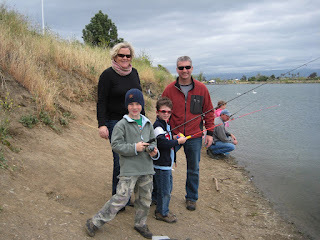 Last week saw the county host a youth fishing event at the local percolation ponds. It was a overcast day (see below) with intermittent showers, but the event was very well attended. * to be fair to the boys we didnt really have the right tackle for catching trout in a pond - but we had fun neverthe less. 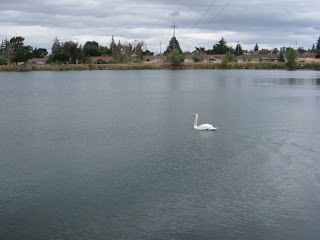 We saw lots of birds landing and taking off from the ponds which is always fun, saw a large carp taunting us from the shallows, and a couple of turtles. Here are a pair of Cookie A's Monkey socks. I've knitted the pattern previously, but the old socks felted in the wash and I think no sock wardrobe is complete without a pair of Monkey socks (I dont know if it's the most popular sock pattern but it certainly feels like it). The yarn is some unidentified wool I bought from Green Planet Yarn in Campbell. I lost the label so I'm hoping it is superwash. I think it's likely as these days I really don't buy handwash sock yarn any more...I am happy to handwash woolens...my problem is remembering which socks require handwashing...hence the felting problem! The socks below are for Adam - shorty socks as usual for him. My usual pattern knitted over 54 stitches. 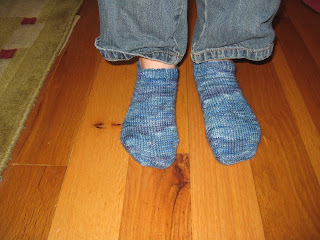 The yarn is Pagewood mills merino superwash in Denim, left over from Nigel's similar short socks. This I know washes beautifully and retains its drape after several washes. That makes it worth while knitting the yarn which was rather splitty. Adam is most pleased that he and Nigel have matching socks.